The basic idea behind deploying MIMO Systems is to use the multipath channel environment to increase the data rates (bits/sec)) and to improve the signal quality (BER) of a communication system by using multiple TX/RX antennas through a wireless link where the transmitted signal is expressed in three dimensional and described in terms of time, frequency and space when traveling over multiple transmission paths and collected in a smart way to obtain optimal gains. 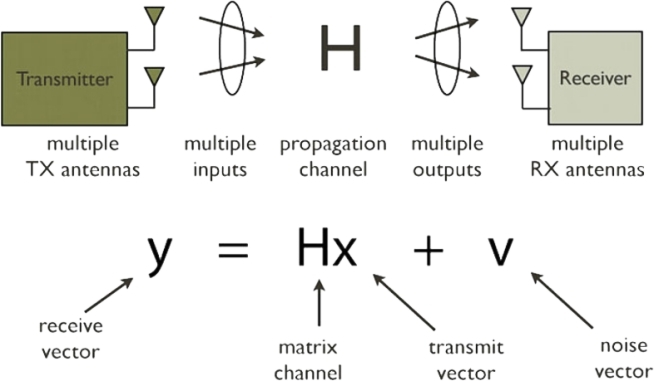 The core of any MIMO system is the space-time coding (STC)which implements two main functions of STC; Diversity and Multiplexing as MIMO is not a multiple access technique however it uses the same frequency and operates simultaneously over multiple paths so no code separation required in MIMO systems and there’s no need for using steerable beams or smart antennas. Regardless of different multiplexing techniques (SIMO & MISO) MIMO provides a way to increase capacity without increasing power.